BMW’s Mark Fendley and Eric Hayler are contributing their expertise in continuous improvement to the work of improving education in Spartanburg County, S.C.
Eric Hayler’s daughter, Jazz, started kindergarten in 2015 in Spartanburg County, S.C. For the BMW associate, the experience of sending his youngest of two daughters off to a local public school triggered the usual parental concerns about whether Jazz was ready and how she would do. Hayler earned a Ph.D. in chemistry and started his career in the chemicals business. 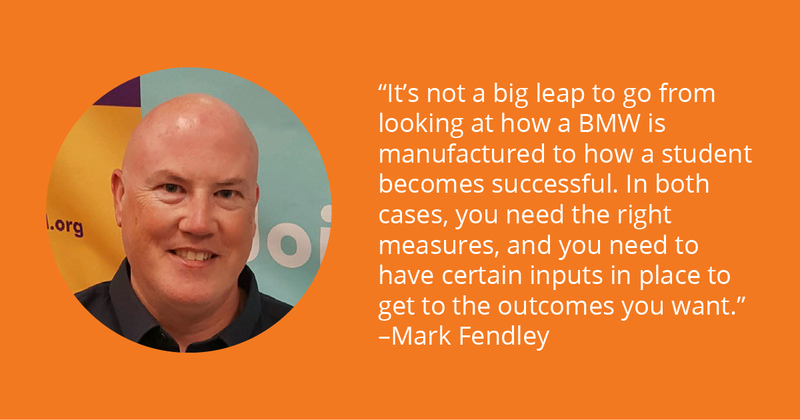 Eventually, he found his way to a laboratory position with BMW Manufacturing, where he developed a passion for scientific, data-driven approaches to continuous quality improvement. 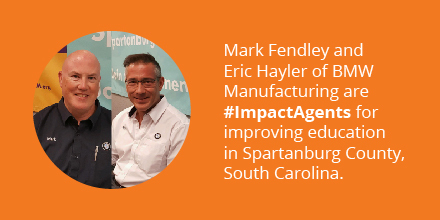 Now, together with BMW’s Continuous Improvement Training Manager Mark Fendley, Hayler is responsible for training initiatives targeting more than 9,000 people who work at the auto manufacturer’s Spartanburg plant. In addition to their BMW responsibilities, both Hayler and Fendley have become actively engaged in the work of Spartanburg Academic Movement (SAM), formed in 2014 to strengthen academic achievement for all children in the urban-rural county of 288,000 residents. The Spartanburg Academic Movement is an “all-in partnership” of schools and colleges, businesses, governments, foundations, faith communities and individuals across the county in pursuit of high levels of educational achievement. The idea of tapping into BMW’s expertise in continuous improvement methodologies originated with Beth Thompson, who manages local efforts that Spartanburg Academic Movement is coordinating to align local leaders to work on key goals for improving education across the cradle to career continuum. “We went to BMW just to try and strengthen our staff capacity when it comes to continuous improvement, and it’s turned into something we really couldn’t have imagined at the start,” said Thompson. In their work with both BMW and Spartanburg Academic Movement, Hayler and Fendley are applying the tools and techniques of Six Sigma. It’s a methodology for continuous improvement that originated in the 1980s as Motorola engineers set out to improve manufacturing processes in ways that would result in a minimal number of product defects (Six Sigma literally refers to six standard deviations from the mean). Over time, businesses large and small made Six Sigma the centerpiece of their improvement strategies, whether in manufacturing or back-office functions like HR and accounting. Even before getting involved with Spartanburg Academic Movement, Hayler had experimented with applying Six Sigma tools to the work of improving education. A few years ago, he was part of a group of parents, teachers and administrators tasked to develop plans for improving student academic performance at the elementary school that his older daughter, Zora, was attending. Hayler helped the group through the process of using Six Sigma tools to forecast the future direction of student test scores based on the school’s adoption of various instructional improvements. “It was a good way to apply Six Sigma, and it gave me confidence that this is something that can work in education,” Hayler said, adding that the school’s test scores have indeed seen strong gains. Hayler also served on the board of a different group that used continuous improvement tools and other business methods to strengthen schools in a neighboring county to Spartanburg. Based in part on those experiences, Hayler responded enthusiastically when Beth Thompson approached him on behalf of Spartanburg Academic Movement. At Thompson’s request, Hayler signed up to join her in facilitating the work of SAM’s first collaborative action network, which is focused on kindergarten readiness. Convened in early 2014, the network includes representatives of each of Spartanburg County’s seven school districts, together with nonprofits, philanthropy, United Way and others working on early childhood issues. With Hayler’s help, the group has spent nearly two years applying Six Sigma to the challenge of increasing kindergarten readiness countywide. The first step for the kindergarten success network was to identify everyone and everything that contributes to a child’s early learning and development. “That conversation took a while but it really focused everyone’s attention on the process of getting a child ready to learn,” said Hayler. Next, the group used brainstorming and charting exercises, as well as other activities, to identify the most critical factors to look at in the next phase of their work: measurement. 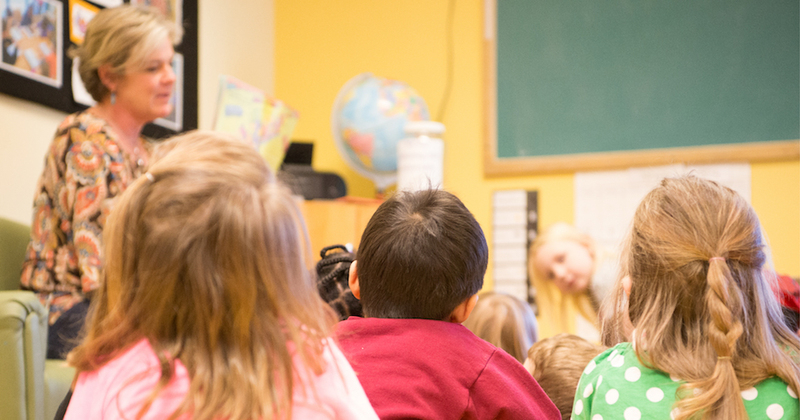 Among the factors that rose to the top of the list: the availability of early screenings to identify developmental delays; preschool quality; and attendance at 4-year-old kindergarten (“4K”) programs. This, in turn, led to the development of a study exploring the role of these and other factors in kindergarten readiness in 5K classrooms in one of the county’s school districts. With data from their study in hand, the partners in the collaborative action network were able to move beyond analysis to action. For example, the group’s data showed a significant relationship between the number of days a child was present in 4K and that child’s readiness for kindergarten. This, in turn, has led the group to launch a number of efforts to increase 4K attendance — for example, through the adoption of new systems for personal outreach to parents if a child is absent for more than two consecutive days. Similarly, the study showed a significant difference in key readiness scores based on a child’s disability status. This has led to plans for improving developmental screenings in the early years and reversing the effects of delays that show up before kindergarten. The group also spent a lot of time thinking about the kind of data it needs to keep driving improvement. In the course of their work, network members decided they weren’t totally confident in the scores from state-mandated kindergarten readiness assessments, which showed wide (and surprising) variation in student scores across assessment categories where one would expect to see similar results — for example, between phonological awareness and vocabulary scores. As a result, the collaborative action network is working on the development of a new, shared data collection system at 5K entry that can be applied countywide; the group will be piloting a new data collection and measurement tool this year. Beth Thompson said Hayler played “an essential role” in the collaborative action network’s ability to come up with a solid set of plans for increasing kindergarten readiness (see sidebar). While it’s too early to track the results of these plans, she said she is confident Spartanburg is on the right track. “Thanks to Eric and BMW, we have worked through the process of fully understanding where our attention needs to be, and we have confidence in our decisions because they are based on local data and a thorough process of thinking through what needs to happen,” she said. As part of BMW’s support for Spartanburg Academic Movement, it provided Thompson with five weeks of training on the way to her receiving her own Six Sigma certification. Hayler was her coach and mentor through the training. Spartanburg Academic Movement’s new data manager, Glen Carson, also is enrolled in BMW’s training for his certification. According to Thompson, this will provide SAM with an in-house understanding of core principles and practices so it can embed Six Sigma more deeply into its work. Meanwhile, Mark Fendley from BMW is now co-facilitating Spartanburg Academic Movement’s collaborative action network on college and career readiness, working with the group through the same process the kindergarten success network followed with Hayler’s help and support. Fendley, like Hayler, has children enrolled in the local public schools and is passionate about improving education in Spartanburg. Seven years ago, Fendley and Hayler co-founded a summer camp for rising high school seniors interested in the “STEM” subjects of science, technology, engineering and math. Fendley came up with the idea after his son attended a STEM camp at Fendley’s alma mater, Georgia Tech. BMW supports the camp, which is free for students and is run by University of South Carolina Upstate, the state university located in Spartanburg. Fendley said he and his wife chose to move to Spartanburg 18 years ago in large part because they saw it as a community that valued education. Now, he’s one of two concerned dads who are eager to see their community bring the same rigor to improving education — for their kids and others — that their employer brings to the work of building cars. “We consider ourselves umbilically connected to SAM’s work because education is that important,” said Fendley.